What Is the iPhone OS (iOS)? Apple's mobile operating system — iOS — runs the iPhone, iPad, and iPod Touch devices. Originally known as the iPhone OS, the name was changed with the introduction of the iPad. It uses a multi-touch interface in which simple gestures operate the device, such as swiping your finger across the screen to move to the next page or pinching your fingers to zoom out. There are more than 2 million iOS apps available for download in the Apple App Store, the most popular app store of any mobile device. Much has changed since the first release of iOS with the iPhone in 2007. In the simplest terms, an operating system is what lies between you and the physical device. It interprets the commands of software applications (apps), and it gives those apps access to features of the device, such as the multi-touch screen or the storage. Mobile operating systems like iOS differ from most other operating systems because they put each app in its own protective shell, which keeps other apps from tampering with them. This design makes it impossible for a virus to infect apps on a mobile operating system, although other forms of malware exist. The protective shell around apps also poses limitations because it keeps apps from directly communicating with one another. Can You Multitask in IOS? Multitasking in iOS is straightforward. Apple added a form of limited multitasking soon after the release of the iPad. This multitasking allowed processes such as those playing music to run in the background. It also provided fast app-switching by keeping portions of apps in memory even when they weren't in the foreground. Apple later added features that allow some iPad models to use slide-over and split-view multitasking. Split-view multitasking splits the screen in half, allowing you to run an individual app on each side of the screen. How Much Does iOS Cost? How Often Is It Updated? Apple does not charge for updates to the operating system. Apple also gives away two suites of software products with the purchase of iOS devices: The iWork suite of office apps — which includes a word processor, spreadsheet, and presentation software — and the iLife suite, which includes video-editing software, music-editing and creation software, and photo-editing software. Apple apps like Safari, Mail, and Notes ship with the operating system by default. 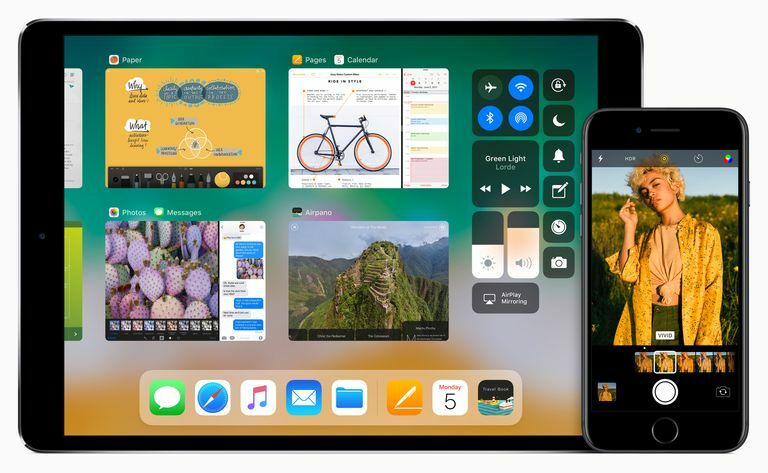 Apple releases a major update to iOS once a year with an announcement at Apple's developer conference in early summer. It is followed by a release in early fall that is timed to coincide with the announcement of the most recent iPhone and iPad models. These free releases add major features to the operating system. Apple also issues bug fix releases and security patches throughout the year. While it may sound like the plot of a bad Hollywood movie, there is an ongoing war — or, at least, an ongoing tugging match — between software developers and hackers. The small patches throughout the year are often aimed at patching holes in the device's security layer. When your iPhone or iPad alerts you to a pending update, install it within a day or two. Update your iPad or iPhone even when the release seems minor. The easiest way to update your iPad, iPhone, or iPod Touch is to use the scheduling feature. When a new update is released, the device asks if you want to update it at night. Simply tap Install Later on the dialog box and remember to plug in your device before you go to bed. You can also install the update manually by going into the device's settings, selecting General from the left-side menu and then selecting Software Update. This menu takes you to a screen where you can download the update and install it on the device. The only requirement is that your device must have enough storage space to complete the process.